The frequency of western U.S. wildfires has increased by 400 percent since 1970. California, Colorado, Arizona, and New Mexico experience the worst damage. These fires have burned six times the land area as before and last five times longer. Their fierce temperatures consume all nutrients and vegetation, leaving little to grow back. As the Ranch Fire became California's largest-ever wildfire during the past weekend, the county where it's doing the most damage—Lake—continued assessing the toll on local farmers and ranchers. 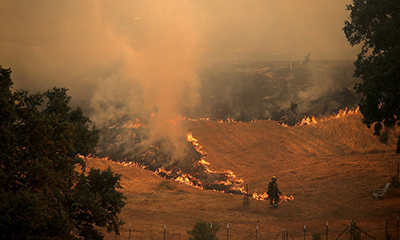 Keith Brandt, compliance and safety manager at Bella Vista Farming in Kelseyville and president of the Lake County Farm Bureau, said he's aware of damage to vineyards in the areas of Upper Lake, Clover Valley, New Long Valley and High Valley. 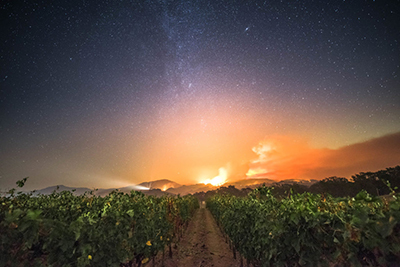 "Damage due to smoke remains a concern, and many growers are assessing vineyard conditions and the appropriate next steps as warranted," Brandt said by email. He added that pear harvest is in full swing and should be completed within the next two to three weeks. The Ranch and River fires, together called the Mendocino Complex by Cal Fire, combined to become the largest wildfire in recorded state history last week, and on Sunday the Ranch Fire, by itself, surpassed the 281,893 acres burned by the Thomas Fire in Ventura and Santa Barbara counties last December and January. Steven Hajik, Lake County agricultural commissioner, said his early estimates show damage to 3.5 acres of pears, 10 acres of grapes and 15 acres of walnuts. Hajik emphasized that these early estimates are subject to change, although the fires were moving away from production areas. "I've seen burned-up orchards and I've seen singed orchards," he said. "I've seen singed grapes and burned-up grapes, same with pears." In addition to smoke concerns for winegrape growers, "we have a lot of young plantings of grapes," Hajik said. "Some of the people could not get in to their properties to properly water them." The largest Lake County impact by far is to rangeland, Hajik said, with 45,000 acres affected. He also estimated 2,000 acres of timber production were damaged, "but that's probably on the low side." To the west, Devon Jones, executive director of the Mendocino County Farm Bureau, said she's working with the local U.S. Department of Agriculture Farm Service Agency office to map properties within the fire perimeter, and reach out to the owners to assess the impact of the fire and the needs of residents. "We've lost a lot of feed, and so there might be a need of trying to coordinate some sort of effort on helping with hay," Jones said, noting that livestock operations had taken the brunt of the fire damage but others had also been affected. "There were some blocks of grapes that were in the fire footprint, but the couple members that I talked to that had irrigation had the sprinklers running, and that really minimized impacts to that vineyard area," she said. Elsewhere in California, two federal Cabinet secretaries—Agriculture Secretary Sonny Perdue and Interior Secretary Ryan Zinke—visited Shasta County, where the Carr Fire had damaged more than 200,000 acres. In Orange and Riverside counties, the Holy Fire, which started Aug. 6, had caused no reported damage to agriculture, according to the Orange County Farm Bureau and the Orange County agricultural commissioner's office. "From what I know of the fire location, it's mostly been centered up in some of the foothills where, historically, there used to be a fair bit of grazing, but all the grazing has been phased out," said Casey Anderson, executive director of the Orange County Farm Bureau. "A lot of the agriculture production is centered down in the valleys and along the transportation corridors here through Orange County." Farmers and ranchers who need assistance with wildfire damage and loss can find information and links to disaster-relief programs at www.cfbf.com/wildfireaid.